In line with the national commemoration of 100 years of women's suffrage in the Netherlands. The discussion about the role of women and male-female relationships in society is more current than ever. Women around the world stand up for their rights and demand recognition. The right to drive, equal wages for men and women, protection against sexual violence and the recognition of the female line in history are just a few examples. Your Voice Matters places the debate about the role of women - in social, historical and contemporary sense - in a broader, international context. Arnhem Museum, Netherlands. Opening March 8 - May 12, 2019. Two art works were commissioned to respond to Nobel Prize winning laureates books: Midaq Alley By Nagiub Mahfouz and The Unwomanly Face of War by Svetlana Alexavitch. Opening February 3 - March 3, 2019. Sabrina Amrani Gallery is pleased to present Watch Before You Fall, a solo show by Manal AlDowayan. In this exhibition, AlDowayan looks at symbolism found in books written about women’s bodies, using soft sculpture, ceramics, and fabric. AlDowayan describes this exhibition as “a space that stands between fear and activism; the artworks are symbols of the resilience and fragility of both the context and the artist”. In Watch Before You Fall, AlDowayan attempts to fragment these symbols and reconstruct them to create a new form, a room full of ‘healing totems’ that alter perceptions and corrects memory. These totems will be permanent memorials to stand against the attempt to reduce the complex into simple symbols. The forms AlDowayan developed for this project are meant to initiate an internal and external dialogue about symbolism and feminism in the context of religion, politics, and media. Sabrina Amrani Gallery, Madrid, Spain January 12 - March 30, 2019. This exhibition surveys a series of works that looks at AlDowayan's production over the past fourteen years. This exhibition narrates the context of AlDowayan's current exhibition Watch Before You Fall showing in Sabrina Amrani's Gallery in Carabanchel. Sabrina Amrani Gallery, Madrid, Spain January 12 - February 12, 2019. The exhibition contextualizes an expansive field of image- based work through various themes that have been featured in Tribe Magazine since it was established in Dubai. The exhibition is held at the American University Museum, Katzen Arts Centre. Washington DC, USA. Nov 10 - Dec 16, 2018. The Albukhary Foundation Gallery of the Islamic world represents an exciting new vision, displayed across two magnificent refurbished galleries at the heart of the British Museum. The standing and pecking doves aquired by the British Museum in 2017 will be on log term display at the museum. Opened on October 18, 2018. London, UK. The Aga Khan Museum presents this summer’s installation, Suspended Together, which floats above the courtyard café in the Museum’s atrium until October, is a flock of 30 birds representing Manal AlDowayan's response to Saudi Arabia’s travel restrictions. The Aga Khan Museum. Toronto, Canada - May - October 2018. 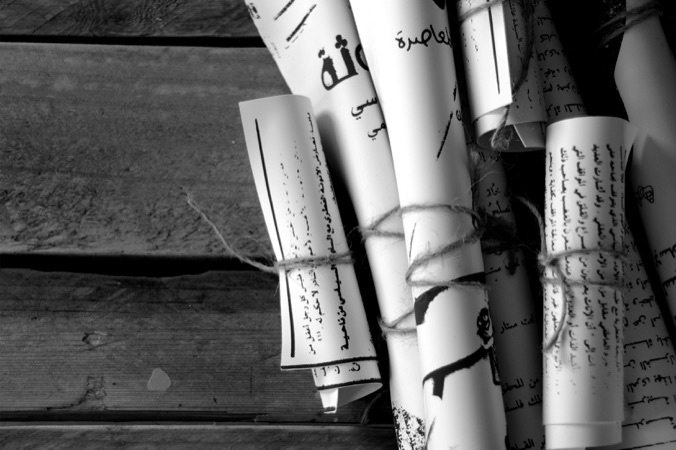 Athr Art Gallery, Warehouse 421 and Abu Dhabi Art present a group show featuring 14 artists who draw from landscapes and cityscapes in the Arab world, the show is inspired by the book "Letters to a Young Muslim" by the UAE Ambassador to France, H.E. Omar Saif Ghobash. Warehouse 421. Abu Dhabi, UAE - Nov 14 to Jan 16, 2019. FEMITOPÍAS: mujeres, feminismo y cultura visual in Centro de Arte Contemporáneo Rafael Botí. Cordoba, Spain - June - September 2018. The exhibition explores issues such as nostalgia for ancient forms and a bygone era; for the depiction of solitude, ruins, and passing time. Boghossian Foundation. Brussles, Belgium - March - August 2018. Comissioned by the Department of Culture and Arts in Abu Dhabi to respond to a UNESCO hertitage site in AlAin Oasis, UAE. November - January 2018. Curated by AMUM, selected work ranges from seemingly traditional manuscript illumination to bold “calligraffiti,” from bronze sculpture to sound and “scent” portraits, from cell-phone photography to multi-media installation. Saudi artists address issues that resonate throughout the world: environmental degradation, economic disparity, urban growth and loss of traditional culture, social inequality of women and minorities, and escalating tensions between and among ideologies. While these concerns may be universal, Saudi artists approach them through the lens of their country’s unique history and forms of cultural expression. the Art Museum of the University of Memphis (AMUM). Memphis, USA - October 8 - Jan 6, 2018. A two day forum that highlights the current state of leadership among women in all sectors in the MENA region. Casa Arabe. Madrid, Spain - May 8-9, 2018. Guest speaker at the Human Capital Forum, a two day forum that highlights the importance of investing in creativity for social impact. Kuwait, January 24-25, 2018. Invited to present at the final series of an artist-led symposium that discusses current activist and feminist perspectives in Scandinavia and the Middle East. Oslo, Norway - October 21-22, 2017. Tribe Magazine Featured Artist - Text By Laura Barlow - Issue Q4 2018, Cover and 12 Page Image Spread. Hitting the Road (Driving) - By Manal AlDowayan - The Forcast Issue: A View Beyond The Horizon, Issue 07, 2018 - Published by The Monocle Magazine. I Am – By Manal AlDowayan, the Visual Research and Social Justice special issue of Studies in Social Justice Journal. A creative intervention piece for the Visual Research and Social Justice special issue of Studies in Social Justice Journal. This special issue of Studies in Social Justice (SSJ) as contributing to reflections on and interdisciplinary conversations about visual research that build on considerable existing knowledge, particularly through an emphasis on relationships between visuality and social justice. It focuses, therefore, on qualitative visual research that explores a range of intersections among, for example, filmmaking, photography, digital story telling, visual methodologies, epistemic justice, and social justice processes and interventions. Published December 2017.